Stock market games have a reputation for being, well, boring. 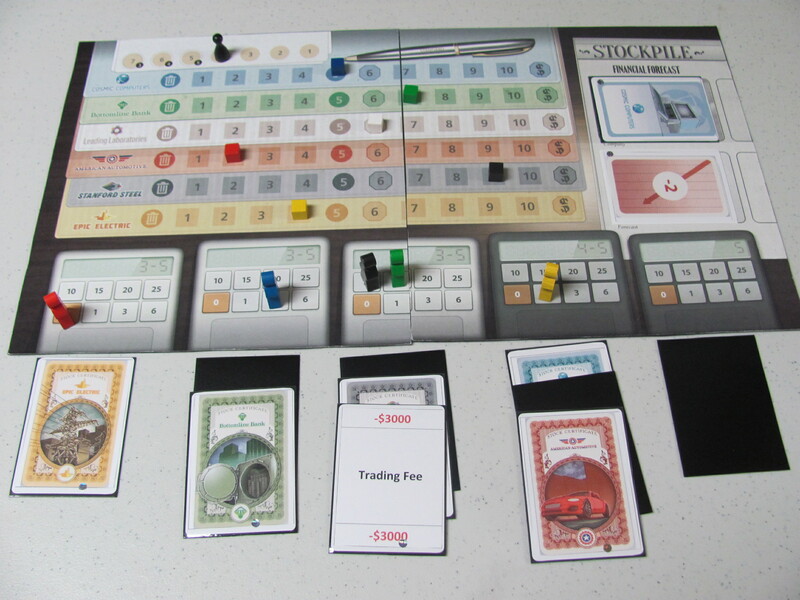 And though I couldn’t say that Stockpile—which has players buying and selling stock certificates with the goal of accumulating the greatest net worth—is a laugh-out-loud kind of experience, I am quite comfortable recommending it as a very interesting and engaging strategy game. First of all, Stockpile really is easy to learn. 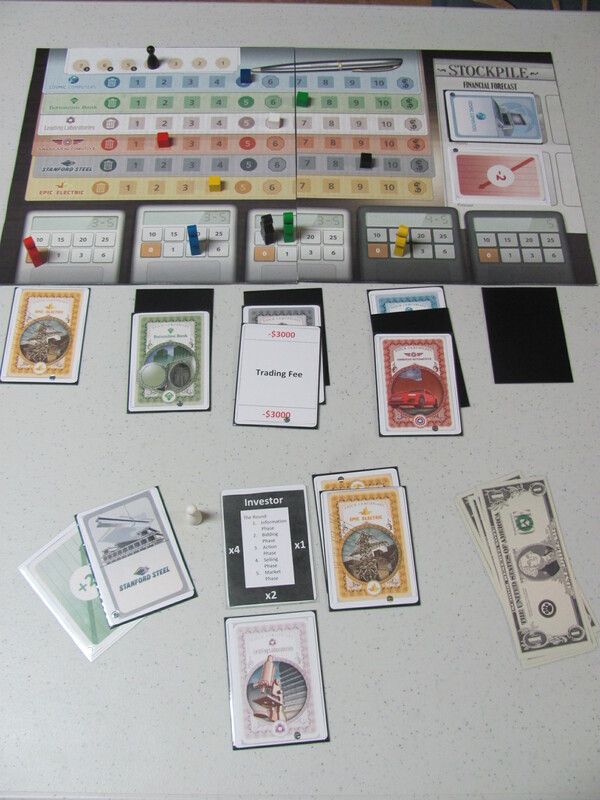 The game proceeds in rounds of buying and selling. 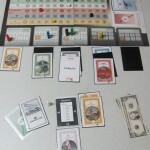 Buying takes place in a combined auction of various bundles—primarily stock certificates, but also trading fees and the occasional bonus action—assembled by the players themselves. 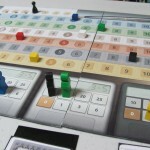 Selling takes place in normal round-the-table turn order, each player having the opportunity to sell any number of stocks at the current market price. Second, buying and selling are both spiced up with a bit of hidden information. At the beginning of every round, each of the players is dealt a set of company and forecast cards, which are later used after the selling phase (at the end of the round) to adjust market prices. In between, as the players add certificates from the draw pile to the stockpiles for auction, each places one face-up and one face-down. Simple mechanics with a twist of secret knowledge makes for some interesting choices and results in some tense moments, in both the auction and selling phases. 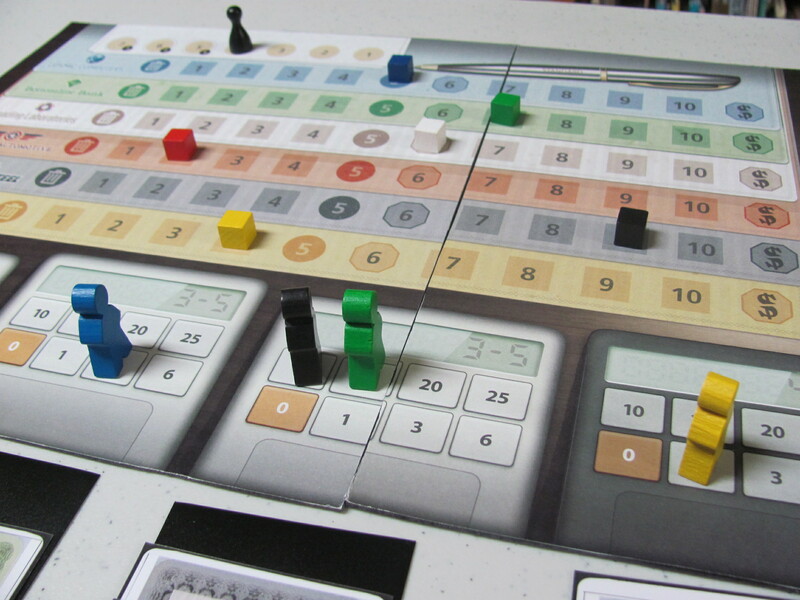 For example, the selling phase can see runs develop on a particular stock when one player sells it and the others suspect insider information. As company stock values move up and down in the market, they may occasionally split, go bankrupt, or pay dividends. Relatively easy to track, these thematic details further enhance the sense of market volatility without appreciably adding to the complexity of the game. Overall, while no real-time zombie game, Stockpile does a great job of finding fun in the world of finance. A game of Stockpile takes about an hour and handles up to five players (in fact, it probably works better with the full complement of five, which is how I played it each time). The Kickstarter project was launched today by Nauvoo Games with a goal of $25,000 and an estimated delivery date of July 2015. 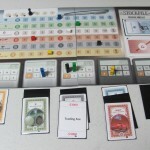 A prototype copy of Stockpile was provided free for review by Nauvoo Games.